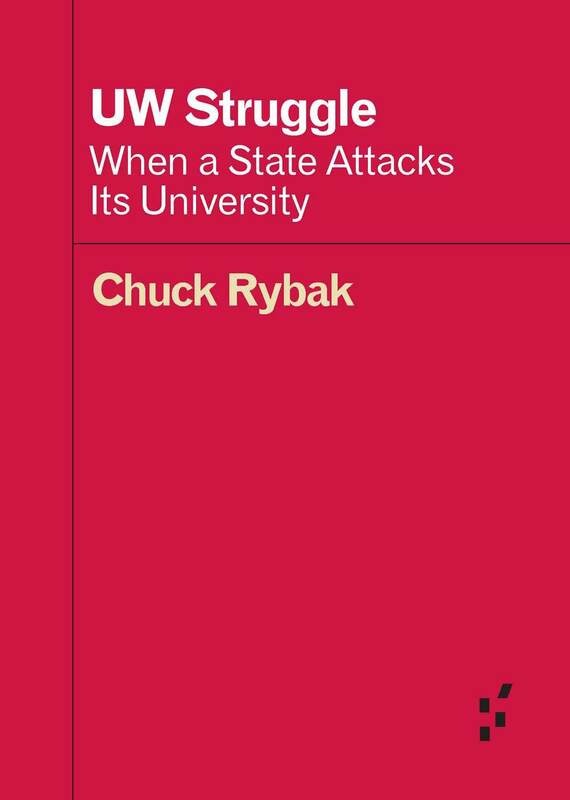 There are other books about higher education that provide a wider, more comprehensive view, but Rybak's purpose is different. His book is an in-the-moment, personal chronicle that also has much to say about the systems of economics and education in the U.S. To learn more about the origins and motivations of what's happening, it's good to read the work of people like Marc Bousquet, Tressie McMillan Cottom, Sara Goldrick-Rab (formerly of UW herself), Henry Giroux, Christopher Newfield, and, for an overview of the history and economics of neoliberalism (the fuel in the engine of this disaster), Philip Mirowski — but to know what this looks like on the ground, to feel the assault, there's nothing better than Rybak's gut punch. 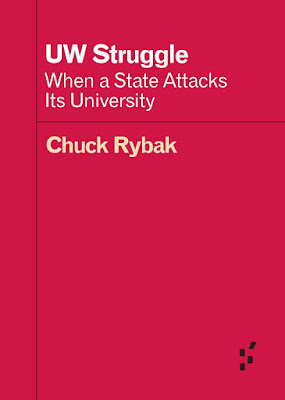 The book is a selection of Rybak's blog posts during the time when Gov. Scott Walker and his minions in the legislature and on the Board of Regents waged war against the state university system, cutting funding drastically, weakening shared governance, and eviscerating tenure. Much damage was done — the changes to tenure cost the University at least $9 million in funds they had to spend to retain some star faculty, and with a tenure system that now, in Rybak's words, "has as much weight as wearing a shirt that says 'tenure' on the front", the university will continue to struggle to compete for hiring and retention with other schools, and will have to continue to spend money on increasing salaries to balance out the effect of fake tenure. (This is happening now.) In the humanities, this will be less of a problem, since there are so few jobs and so many candidates that just about any offer providing even a barely living wage and some access to health and retirement benefits is a great offer, but in fields that university administrators and legislators actually care about (business, technology, certain narrowly vocational fields), it's a much tougher sell. If it hasn't already, this will be your state soon. All the fights that we thought belonged to the future are owned by the present. Without that fight, without our contributions to it, and without new coalitions, the unthinkable will arrive: there will be no public education to serve as a pathway to a brighter future. What all this made me think about (not for the first time) is that the war on universities is just another sign that we have lost any concept of the public good. I and members of my family have spent much of our lives working for or associated with the University System of New Hampshire (where I'm now finishing my doctorate). We're very familiar with low state funding here in the Granite State, because we've been near, or, most commonly, at the bottom of state funding of education for as long as I can remember. (Indeed, I remember in my first year or so of college at NYU reading an op-ed about education in a free New York weekly. It was written by a UNH professor who said in New Hampshire our university system is public in name only, given how little funding the state provides. That was more than twenty years ago.) We also have the highest student debt. Given the disastrous ways we fund public education generally in New Hampshire, it wouldn't be hyperbole to say the state doesn't care much about education. That wouldn't be quite accurate, though. It's not that people necessarily hate the idea of education and universities and all that jazz, but that there is no great commitment to the concept of education as a public good. Because there's not much commitment to the idea of public goods at all. A historian could probably make a case that the U.S. has never been especially committed to the idea of the public good except perhaps during the New Deal era and the years after World War II. (And with the exception of funding war. We like to give money to war profiteers.) You would think that a country as ostentatiously devoted to patriotism and nationalism as the U.S. would be better at putting its immense wealth into the service of all its citizens, but that's very much not the case, and patriotism and nationalism in the U.S. are little more than bromides and excuses for thuggery. A vigorous, well-funded public sector is not only the height of a society's accomplishment, but it is what allows a society to achieve anything meaningful at all. Without a commitment to the public good, a society becomes nothing more than a bunch of individuals in a social darwinist hunger games competition, with the winners drinking the blood of the losers and laughing with the thrill of victory as they watch the destitute turn to cannibalism.